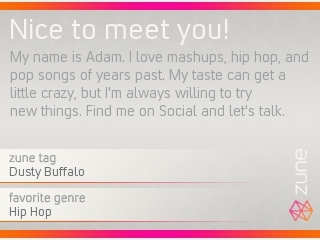 To make your own, just enter your favorite genre, your Zune Tag, a little bit about yourself, and a tagline and hit generate. The result is a nifty jpeg that you can beam to other Zune owners on-the-go. I hope to get to try this out soon!